Oh hi…I have a blog. One that I used to post to regularly, even. Then baseball happened. Scorch got pulled up a division, so he’s going 3 days a week. Bean is playing t-ball so that’s 2 days a week. Most days we’re rolling home after school at 5 pm, then leaving again at 5:30. Things like homework and dinner have fallen completely to the wayside since we don’t get home until after 8 most days. Thank goodness Scorch gets up early to do his work and that both kids love breakfast and PB&J for dinner. Don’t get me wrong, we really love baseball. The kids love playing it, the Hubs loves coaching it and I enjoy socializing in the stands. Win/win/win. But, I’m tired. Add in a kitchen remodel and well, you get even more craziness. The upshot is that our kitchen remodel went so very much more smoothly then I had hoped. 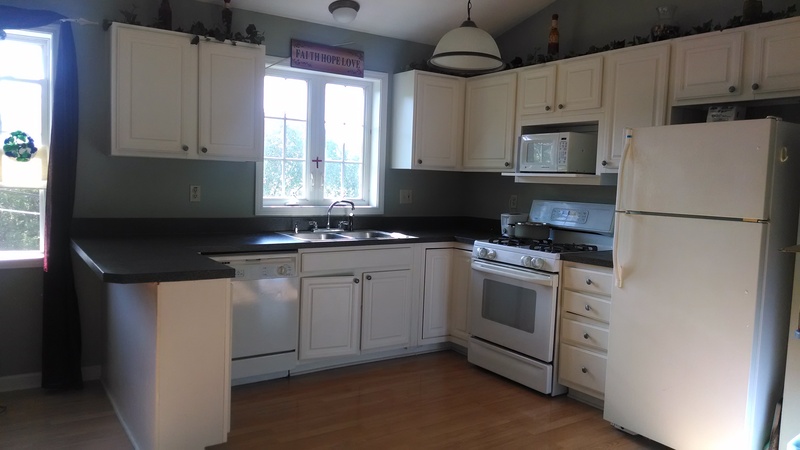 We bought our kitchen through Lowes and while they were wonderful during the design and buying process, they basically disappeared once the contract was signed. Thankfully our contractor went above and beyond to make this as painless as possible. I can’t say enough good things about the contractor and his crew. Here was our kitchen before. It was small and cramped with next to no storage space. The cabinets were cheaply made and the white laminate was peeling off. 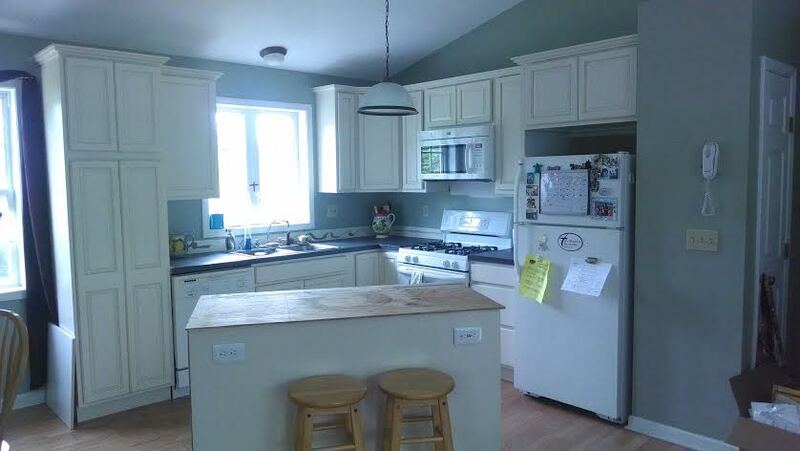 The cabinets over the fridge were basically inaccessible because they sat so far back. What you don’t see in this picture is all the stuff that normally sits on my counters because there is no other space for it. Bread, medicines, fruit and mail cluttered our counter tops because there was literally no space to store it all. I loved it because it was wide open- to the left is our dining room and I’m standing in the thresh hold to our living room. But something had to change. So, here’s our new kitchen. We’re waiting on the counter tops to be edged, so that isn’t installed yet, nor is the backsplash. The cabinet handles are on order so those will go on soon. And the new flooring? Well- that was the one snafu we hit but that should be in within a month. But the rest of the kitchen, I *love*. We have storage space for everything! I can see what’s in my cabinets and access it all. I’d marry my pantry if it was legal. Once the counter tops go on, they’ll hide the outlets on the island so they aren’t as visible. It’s so much more functional and well worth the dust and disorganization we lived through last week! I cannot wait to see everything completed. So, here’s to 2 more weeks of baseball! You know, before lacrosse and 4 different camps start for the kids. At this rate, I’m pretty sure life will slow down when I’m 50.